The Mississauga House is an approximately 6000 square foot co-housing residence in the urban setting of the city of Mississauga Ontario Canada. Commuter trains, buses, and shopping are all available within short walking distance. The home is shared by three residents who share a concern for healthy housing and reducing impacts on the environment. This home incorporates leading edge principles of holistic eco-design. The roofing, seen in the picture to the above, integrates solar photo voltaic cells which generate electricity and solar hot water heating. The south face of the home incorporates the principles of passive solar design through the use of extensive large windows and concrete floors to store the heat from the sun. Cooling is maintained through effective shading and landscape features. The walls throughout the ground floor are straw bale insulation with a concrete plaster. 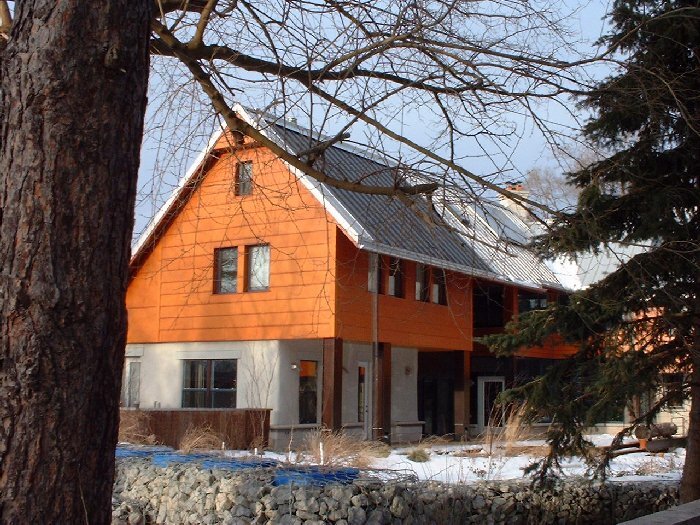 The Mississauga house, designed by Martin Liefhebber, is one of the largest straw bale homes ever built. The ground floor is entirely straw bale construction. Other notable features of the design and construction include the use of materials from the site including some large maple tree trunks. This home was a first for the city of Mississauga. In fact, the owners and Martin Liefhebber spent a year fighting for the right to build with straw bales in the conservative city of Mississauga. This important win means that the path for others towards a sustainable home will be easier. The aesthetic beauty and technical efficiency proven in this co-housing residence will no doubt encourage others to follow. The west side of the home uses natural materials to provide a barrier from the main street. The angles of the roof are designed to ensure solar access is optimized on the south side. The wonderful organic shapes of the ground floor walls reflect the personal touch enabled through the use of straw bales. The windows on the roof provide extensive natural lighting throughout. The main entrance is well protected by the archway formed out of the straw bale walls on both sides. 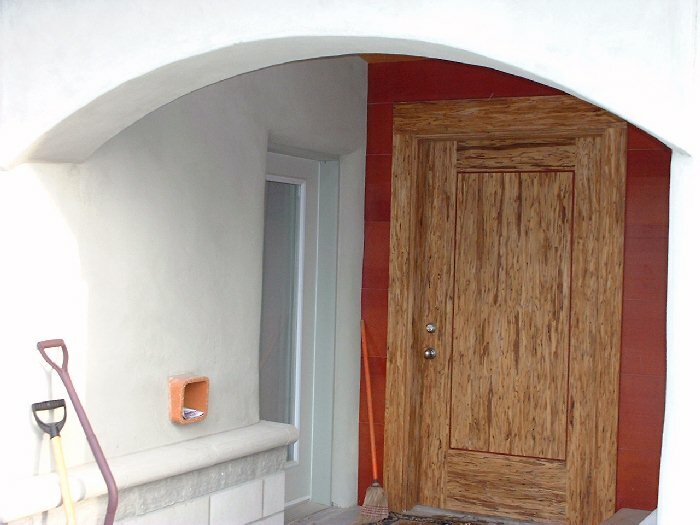 The door is custom made from paralam engineered wood product. Welcome to a little piece of housing heaven. The south side of the house and property is protected by natural landscaping designed by one of the owners. Professional passive solar design provides extensive shading for summer cooling. Rain water is collected from the roof and used to water the garden. 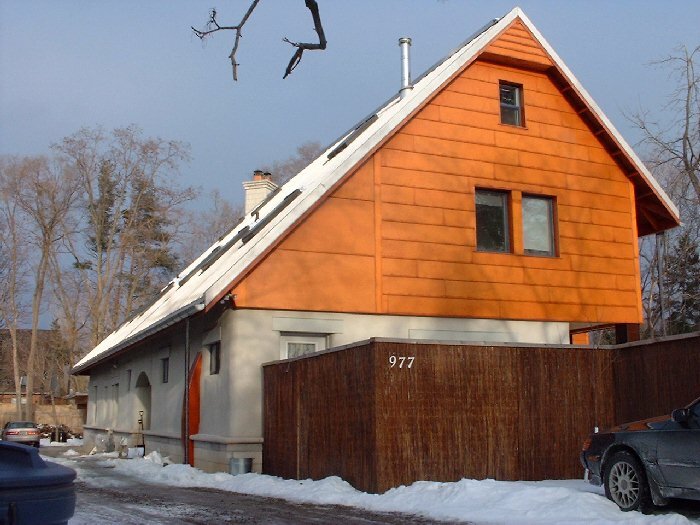 The south face of the home provide plenty of windows for passive solar heating in the winter while the shading keeps things cool in the summer. The roofing system incorporates a new type of flexible solar cell material. In the upper right corner you can see part of the solar water heater system. The home combines passive solar, active solar, high insulation including straw bale walls. The fibre glass windows are doubled paned and filled with argon gas for superior insulation values. 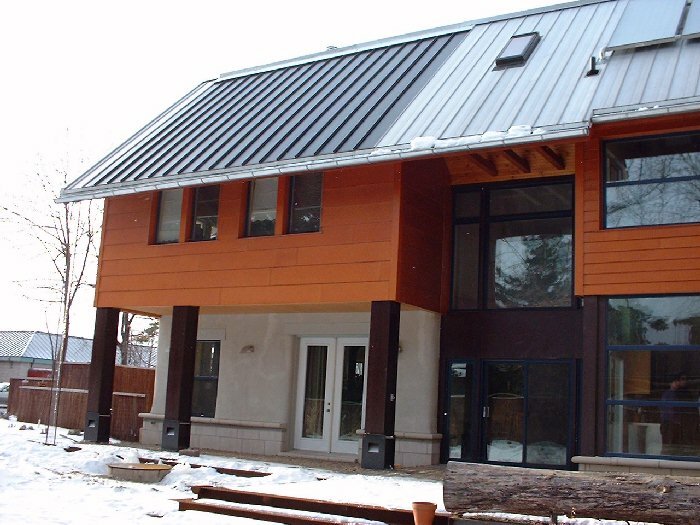 Two types of solar collectors are clearly visible in contrast to the steel roof. The solar water heaters on the right supplement the boiler for hydronic in floor heating. The photo voltaic system, is the darker part of the roof, on the left. The ground floor is picture perfect. Comfort, artistic flare, and cozy wood stoves create shared areas and private spaces. 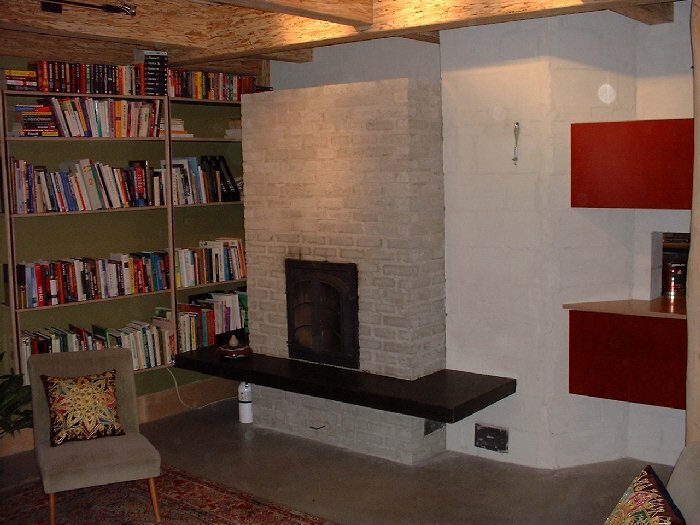 The concrete alcove carves out a warm sitting area while absorbing the heat from the EPA rated wood stove. A small private kitchen area is tucked neatly up above with lots of hidden storage and shelving space. 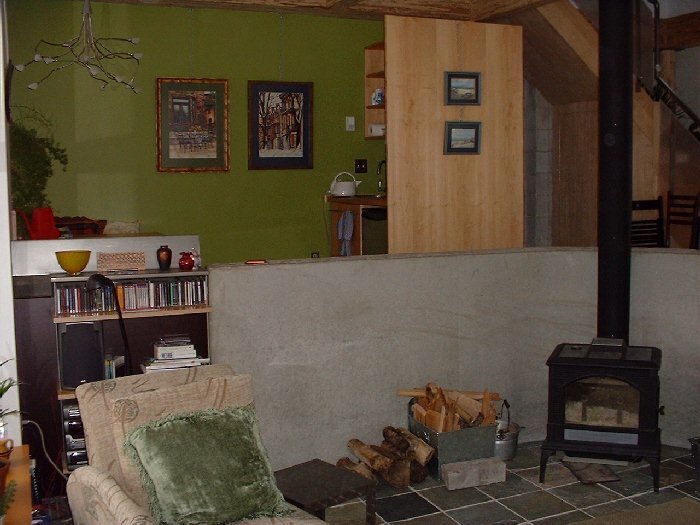 A large masonry wood stove in the centre of the home provides a shared source of heat. The block walls and concrete floors absorb heat in order to allow the rooms to stay warm for long periods of time in the winter. Check out this video interview with the co-owners. Learn how the came to create this co-housing masterpiece.